Home > Blog > Posture > How Do I Fix Uneven Shoulders? Please Help Me Correct My Posture! The following post is based on a Q&A between me and one of my readers, Arnaldo. 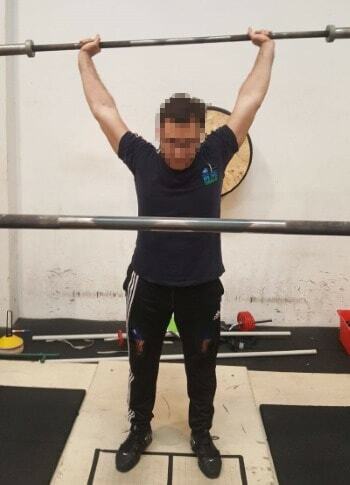 Arnoldo wanted to fix his uneven shoulders, which was affecting his overhead lifts. Hey Alex! I came across your upper back anatomy guides, and I think they are really awesome! I decided to write you as I'm really confused about what is happening with my posture and movement patterns recently. It seems I've somehow developed uneven shoulders. They're more or less crooked depending on the movement or position. Please help me fix my posture! I feel there may be a problem on my right side that's preventing my right scapula from elevating, turning and retracting properly. Could this be due to an overactive left levator scapulae? Even when I'm pulling the bar on Olympic lifts you can see that my right shoulder is lower than the left. I just can't seem to elevate the weight evenly. Could my right levator scapulae be damaged? Maybe my rhomboids are too tight? Or possibly my right levator scapulae and trapezius are dysfunctional? These are all just guesses on my part. I should point out that when I retract my scapulae without elevating my arms, like when you retract them for a bench press, I have almost no problem unless a slight pain that propagates from the right part of the neck towards the right deltoid. Here's another photo demonstrating what I said about my uneven third pull. It makes me think something is wrong with an upper body muscle on the right side​. 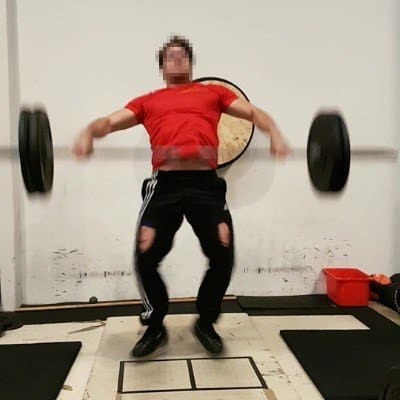 Check out the video below of me performing the behind the neck press. You can clearly see my uneven shoulders at the top of every rep.
​I recorded the above video about two weeks ago. Since then, my situation has gotten slightly better. My shoulders are a bit more even with overhead movements. But it's apparent that my shoulders are still somewhat crooked. Targeting my right latissimus dorsi and rhomboid with intensive stretching and self myofascial release using a lacrosse ball. Targeting my left upper trapezius and levator scapulae with self myofascial release using a lacrosse ball. Stretching my the right rotator cuff is painful. I have no issue stretching the left side. In this last semester at school, I've started working at an office where I'm in front of a computer for several hours every day of the week. Could this have something to do with developing upper crossed syndrome or some other postural disorder? Could this sitting all day somehow shift everything to the left? For the time being, I'm going to cut out all exercises that require raising my shoulder (presses, jerks, Olympic lifts) in order to keep that area relaxed. Just squats! Thank you very much for your work. The world needs more people like you who share such an incredible knowledge! Thank you so much for any help you can provide! Hi Arnaldo. Thanks for the compliments man! I'm pumped my anatomy guides helped you improve. Like you said though, your mobility and posture problem didn't go away completely. I know how frustrating it is to deal with imbalances and the associated symptoms. It seems like there's no clear-cut way to finding the cause of these kinds of problems, let alone a proven strategy for correcting it. 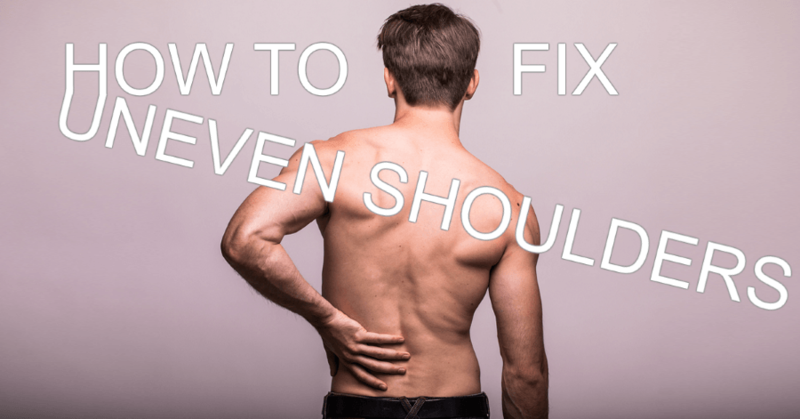 After that, I'll consider the likely possibility that there is a less apparent underlying cause that is a major contributor to your uneven shoulders. This is an important perspective to take because postural/movement distortions are rarely isolated to one small region of the body. There's often a deeper hidden issue that manifests itself peripherally. ...More specifically, this looks like insufficient scapular upward rotation. Scapular upward rotation facilitates proper overhead movement of the arm during the last part of the overhead ROM. The compensation for the insufficient scapular upward rotation in your case appears to be scapular elevation. The main muscles involved in scapular upward rotation, which are often at fault when there's an issue with this scapular movement, are the lower tr﻿﻿aps and serratus anterior. They may be weak, underactive or otherwise impaired. This is often seen in conjunction with overactive pec minor, levator scapulae and upper trapezius. It may help to try releasing the overactive muscles (i.e. myofascial release with a lacrosse ball or other tool) while re-training proper scapular movement patterns and activating/strengthening the lower traps and serratus with drill such as wall slides, forearm wall slides, scap push ups, to name a few. In my experience, doing the release work on the overactive muscles right before the strength/activation work on the underactive muscles seems to work best. The idea is that this "calms down" the overactive antagonist muscles. This then enables you to train the underactive muscles more effectively because they experience less resistance from the antagonists. Is There a Not-So-Obvious a Root Cause? When looking at your problem, it reminded me of a different postural/movement distortion pattern that I read a lot about before (and I also have it, but have since improved it significantly). It's apparently common as far as "unilateral" distortion patterns go (i.e. obvious left/right asymmetries). Read the full article by Eric Cressey here. Okay, so with that as the intro, let me tell you the distortion pattern by name: It's called the left AIC/right BC pattern. If this is indeed your issue (it very well may not be), then it's helpful to understand what's going on: Basically, the left AIC/right BC pattern has a lot do with dysfunction stemming from the left hip flexors and the right chest/front delt/SCM/scalenes/diaphragm. Breathe Better: Use "diaphragmatic breathing." This means breathing through your nose, using proper tongue position (flat, against roof of mouth) and doing full exhales--be sure to research﻿ ﻿more to find more techniques and tips. Try to make this your default breathing habit over time. It'll be tough, but very worthwhile. And I'd bet there's plenty of other health benefits if you improve your breathing (e.g. anxiety/stress reduction, improved focus, etc). If you catch yourself doing shallow breathing, then stop and switch to breathing deeply with your diaphragm. Learn to Rotate Both Sides of Your Pelvis: Teach yourself how rotate your pelvis anterior / posteriorly on both sides individually. This may be easy on one side, but if there's dysfunction, the other side will be hard to move the way you want, at first. But over time, you'll teach yourself how to do this. Become Aware of Your Faulty Postures/Movements (then Work to Improve Them): Make this into a habit. Become conscious of your body. Recognize your poor postural habits and the faulty movement patterns you default to, throughout the day and during your workouts. This is the first battle. Awareness. Because right now you're reinforcing these bad habits unconsciously. Once you realize you're in a bad posture, move to a better one (or at the very least to a different one--that way you break up the time spent in a bad position). If you usually stand or sit to one side/with one hip forward, then make the opposite your default. And also learn to move better. Try to teach your hips/pelvis and torso to rotate as efficiently on the weak side as the dominant side. This is easier said than done. You may not even be able to make your hips/torso/etc. rotate or shift the way it should at first, because you can't effectively activate and control the necessary muscles. But over time, you will get the hang of it. It takes trial and error. And practice, practice, practice. I found that a mirror is a great tool for accelerating the process because you get immediate feedback. It's even better if you can find two mirrors that intersect in a corner, since this gives your "true" reflection (i.e. how your body actually looks--not the reverse image that you're used to seeing in mirrors). Stand More & Move More: Sitting down for long periods of time can definitely cause issues. That's why I have a stand up desk, though I do have the luxury of working from home most days of the week. If you can get a standing desk setup, do it. Otherwise, try to take a break to stand up at least once and hour and move a bit. That breaks up the amount of time you're stuck in that same position and can make a difference. Even if it's literally just standing up and even walking, do it! Do More Unilateral Exercises: There is an obvious imbalance between sides. It may be strength, movement pattern quality or some combination of those and other factors. Whatever the case, unilateral exercises will help bring your weaker/less skilled side closer in strength/ability to your dominant side. Be Patient! Habit change is hard as hell. Focus on easy, big yield habits first and build from there. Don't get frustrated if you fall off. Just realize when you do and get back on the road to better posture and movement! Hey man, thank you so much for your advice! I'm quite astonished--you may have nailed the two causes of my uneven shoulders perfectly! I didn't think to mention this before, but I experienced a strong muscle contracture during heavy triples on front squats a few months ago. It was so deep. I now think it must have affected my diaphragm in some way, since I wasn't able to breath properly without stabbing pains! That lasted 3 days. I'm pretty sure my asymmetry began to accelerate after this point. I've developed a shallower breathing pattern. This is different than the contracture/diaphragm issue mentioned above. Rather, this shallow breathing habit developed more recently. I think it's because of increased stress/anxiety this semester from my new job, a greater course load and other activities. I saw a physiotherapist previously who said I should watch out for a potentially developing "convexity" on the left side of the torso. She suggested I focus on stretching the lateral muscular chains. In particular, she told to make a habit of balancing my posture during squatting, sitting and all other activities! This seems to be in line with exactly what you said. I went to the doctor yesterday and he told me do an cervical X-ray just to be sure that there is no muscular problem and to go to a center specialized in sports traumas. I'll let you know what will be the further developments of this story. Thank you very much again! 1. Stretch everything in the front and activate and strengthen everything in the back. That’s a great summary–thanks for your response Pieter! That’s a good place to start for someone with issues like Roy described. Roy, I think you could benefit from some of the specifics mentioned in the article about breathing, unilateral exercises and trying to “unlearn” the asymmetrical positions/movement patterns you’ve developed over the last few years. Also, if you have any pain/injuries, you ought to seek out a doctor or physical therapist.